The Hills has a new rooftop eatery serving up American-style barbecue. The Hills has a new American-style barbecue joint. 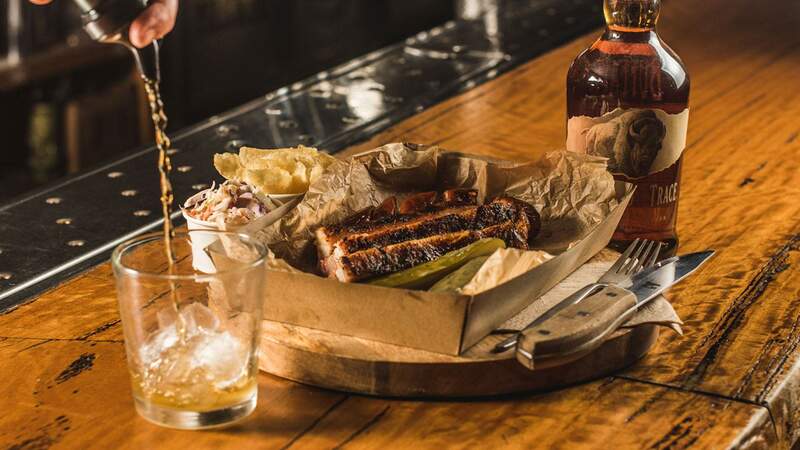 Resting on the rooftop of the newly renovated Hillside Hotel, Fire and Brimstone is serving up smoked meats and smoky whiskeys. Behind the impressively large smoker is pit master Brad Shorten. He's preparing 12-hour slow-cooked brisket, pork belly, pulled pork and a range of hot links (a variety of sausage common in southern American barbecue). Alongside the extensive meat lineup, there's also a host of sides — including house slaw, homestyle mac 'n' cheese and tangy garlic dill pickles. To get the "full" southern barbecue experience, Shorten recommends pairing your meaty feast with a whiskey — specifically Buffalo Trace. To further complement the experience, the rooftop will also regularly play host to bands and DJs spinning soulful tunes. While Sydney has a neat selection of barbecue joints, the north-west is noticeably lacking in smoked goods. Luckily, Fire and Brimstone fixes that — for now. While there's no word yet on how long the barbecue joint will hang around for, Hillside Hotel is known for regularly mixing up its rooftop antics, so we suggest heading in sooner rather than later. Fire and Brimstone is open every Thursday, Friday and Saturday from 6:30pm until sold out.